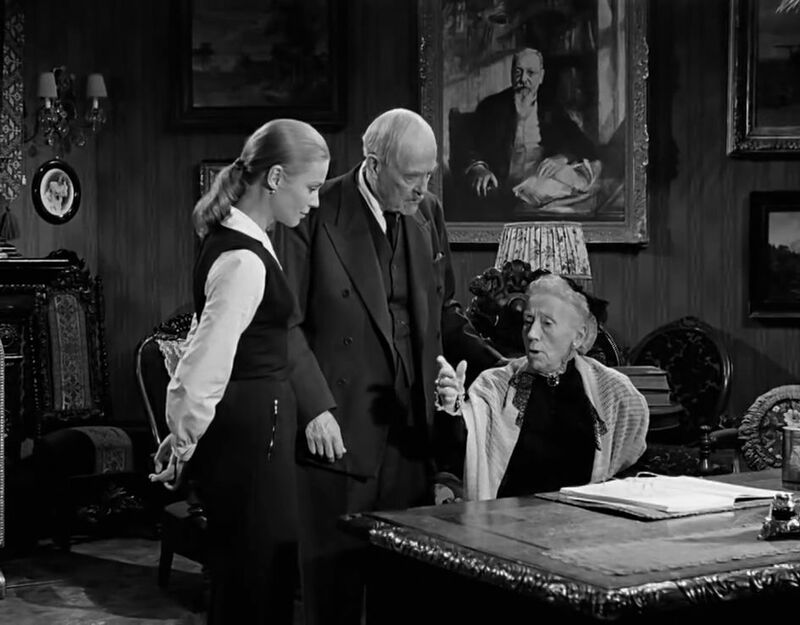 Ingmar Bergman’s Wild Strawberries (1957), widely considered to be one of his greatest films, came directly after his The Seventh Seal (1957), when he reached the pinnacle of his artistic success [1,2]. Though those two films had quite different settings (The Seventh Seal was an expressionistic fable set in the Middle Ages, while Wild Strawberries was a contemporary story about one day in the life of an old man), they both covered people agonizing over life’s meaning. In some ways, though, as I will mention further on, Wild Strawberries continues with an outlook that Bergman had touched on in his earlier To Joy (1950) and Summer Interlude (1951). 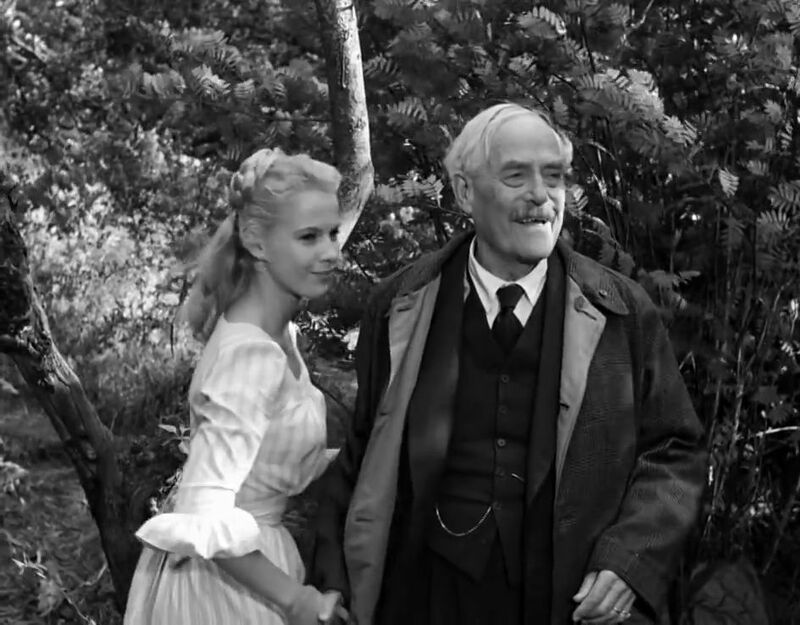 In Wild Strawberries, a 78-year-old emeritus medical professor and physician is about to be conferred as a doctor jubilaris (jubilee doctor), celebrating fifty years of distinguished service. The occasion sets him to reflect on just what he has accomplished and whether he has achieved his goals in life. The film covers his day-long journey by car from his home in Stockholm to Lund, where he had originally received his doctorate and where the doctor jubilaris ceremony is to take place. Over the course of that journey, he has encounters with people along the way and has several disturbing dreams during occasional snoozes that contribute to his increasingly reflective mood. Death. We all know that we will eventually die, but an old man feels death to be imminent. He then becomes, in Heidegger’s terminology, a more authentic “Being-towards-death” and must confront this issue. Judgment. 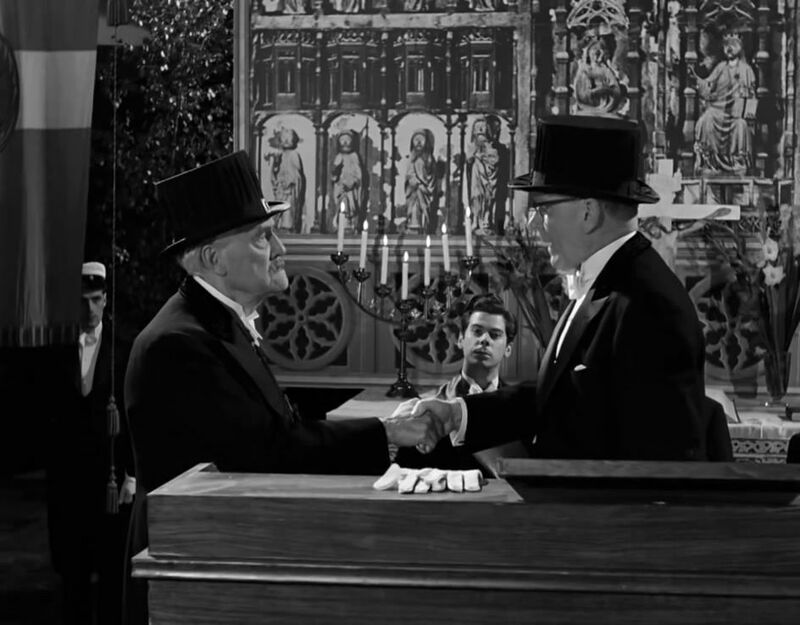 As suggested in Bergman’s earlier To Joy, most young men seek some sort of greatness, without necessarily knowing what form it is to take. Usually men seek honors, wealth, professional distinction, and a successful love life, and these successes are to be verified by external judgments. Resentment. When one is hurt or rejected, one may feel resentment towards the responsible parties. We usually know that this resentment is counterproductive and wasteful – it is a pain even to be around resentful people – but it is difficult to overcome resentful feelings. Withdrawal. One approach to reducing resentful encounters is to withdraw from the conflicting scene. This can make one detached and more objective, but it also means disengagement. Some people nurture a natural tendency to withdraw whenever there is something contentious. Age Perspective. There are basically three age groups in the story: young people (late teens or early twenties); mature people (thirties),and old people. Each group has its own outlook, set of responsibilities, and perspective. Depending on your own age, you are likely to see this movie more specifically from one of these perspectives. Relations with Women. 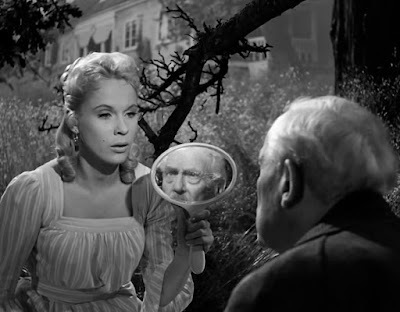 Bergman was fascinated with women and how they related to the world and to men. In this story Isak Borg has interesting relationships with a number of women (Miss Agda, his mother, Marianne, the two Saras, and his wife). All of these themes and issues interrelate to each other and are touched on in the course of the narrative presentation. 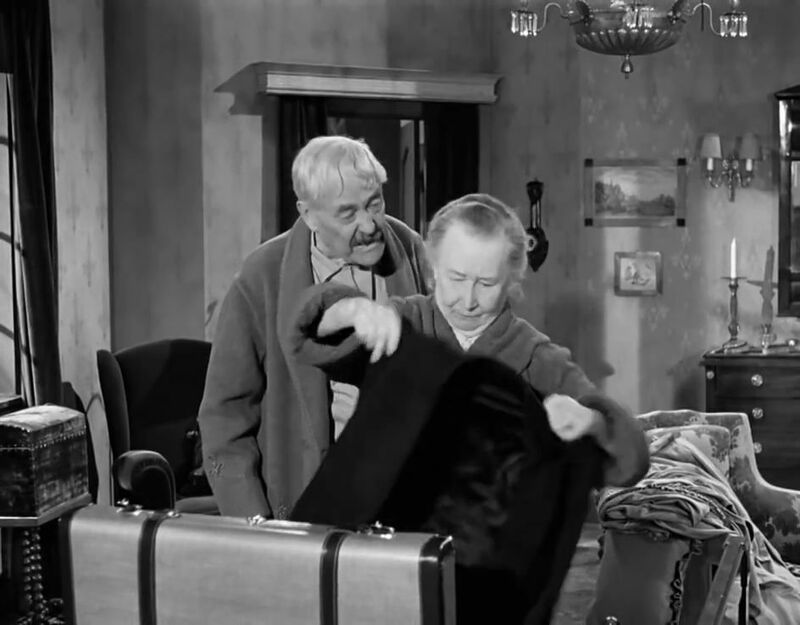 The various scenes of the film can be grouped into the following sections. 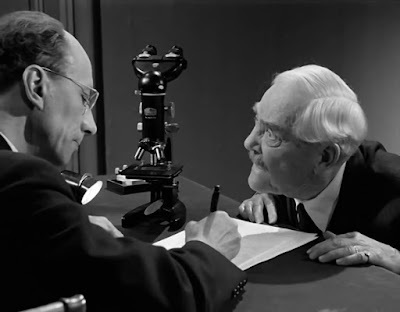 The story begins with Isak (played by famous Swedish actor-director Victor Sjöström) at his writing desk stating that our personal relationships are mainly devoted to discussing and evaluating other people’s behavior (i.e. they are mainly judgmental). That is why he has gradually “withdrawn from nearly all so-called relations.” He also mentions that he started out in life working for money, but ended up with a love for science. Thus it seems that he has chosen a career where his achievements can be measured objectively. He then describes a disturbing, expressionistic dream (Dream1) he had, where he is wandering around in the deserted streets of an old part of Stockholm and sees several symbols of death: a mounted clock with no hands, an eerie man with no face who falls down dead and bleeds profusely, and a horse-drawn hearse carrying a casket. The casket falls to the street, revealing a corpse that is another Isak, a doppelganger. 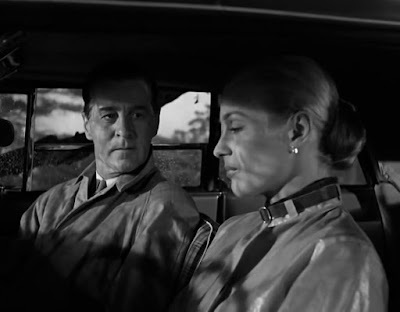 At breakfast, Isak’s daughter-in-law, Marianne (Ingrid Thulin), who has recently been staying with him, says she would like to ride with Isak so that she can go home to her husband (and Isak’s son), Evald (Gunnar Björnstrand) back in Lund. Isak is stunned by these remarks, but as is his custom, he tries to hide his feelings. Note that though the protagonist of this tale is Isak, we will see throughout the film that Marianne seems to be the voice of Bergman. They soon decide to stop and visit the summer house that Isak’s family used to use during his first twenty years. Isak sits down and looks at the now-vacated summer house and lapses into a dream (Dream2a). He has a vision of a time almost six decades earlier when the young girl he loved, Sara (Bibi Andersson, who was Ingmar Bergman’s paramour at this time) is outside the summer house picking wild strawberries. Since there are two Saras in this story, I will refer this one as ‘Sara1'. 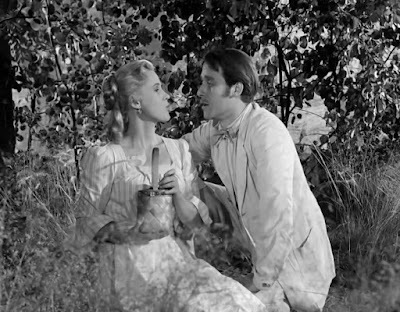 Sara1 is then approached by Isak’s cocky younger brother, Sigfrid, who impudently flirts with and kisses the girl, even though she falteringly insists she is loyal to her upstanding boyfriend Isak. This is clearly a most painful memory for Isak, when the girl he most loved became susceptible to the oily charms of a “good-for-nothing” rogue in his own family. The dream shifts to a luncheon right afterwards in the summer house involving the large Borg family (Dream2b), where Isak’s young twin sisters tease Sara1 and Sigfrid about having seen the two of them kissing. Waking from his painful dream, Isak encounters a young woman hitchhiker, also named Sara (Sara2, also played by Bibi Andersson). Sara2 is unquenchably bubbly, innocent, and flirtatious – a modern girl. She and her two male admirers, one of whom studies science and the other theology, are also headed to Lund and so are invited to climb into the car and travel with Isak and Marianne. On the road, they almost hit an oncoming errant car, which crashes off to the side. The two occupants of this car, Mr. and Mrs. Alman, turn out to be a hopelessly bickering mature couple who spend all of their time in outspoken mutual resentment. This six-minute interlude seems to be a demonstration of just the kind of relationship that Isak abhorred and always sought to avoid. Yet this can be a natural outcome for judgmental people who feel they can score points by continually lodging telling criticisms. 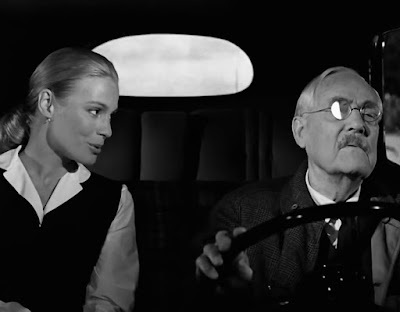 Stopping for gas in the area where Isak had his first medical practice, the gas station proprietor (Max von Sydow) recognizes Isak and tells him that everyone in the area still cherishes his memory and his contributions. Hearing this heartfelt praise, Isak wonders to himself if perhaps he should have stayed in that town all his life instead of going off to pursue greatness. Further on, they stop for lunch at an open café near the home of Isak’s 96-year-old mother, giving Isak and Marianne the time to go off and pay her a short visit. The mother, who was seen in the Dream2b to be bossy and judgmental, is now ice-cold and grumpy. She has outlived all but one (Isak) of her ten children, and now all she has is their old children’s toys – but she can’t remember whose was whose. Sara1 then goes over to Isak’s sister Sigbritt Borg’s baby and offers it motherly tenderness and caresses – exactly the kind of mothering that Isak missed out on. Afterwards Isak peers through a window from outside to see Sara1 and Sigfrid inside showing marital tenderness towards each other. Clearly the marriage of Isak and Karin was a failure and perhaps merely a more reticent and civil version of the type of marriage exhibited by the Almans. At the end of these three dream segments, Mr. Alman remarks that the dreams have all been concoctions of Isak’s mind in order to separate himself from the world. When Isak asks Alman what will be his punishment for this guilt, his judgmental critic responds by saying it will presumably be the usual one: loneliness. In the original Bergman screenplay that I saw, but is not present in the film, there is a fourth brief dream segment at this point where Sara1 comes to Isak and tells him he is supposed to go get his father. 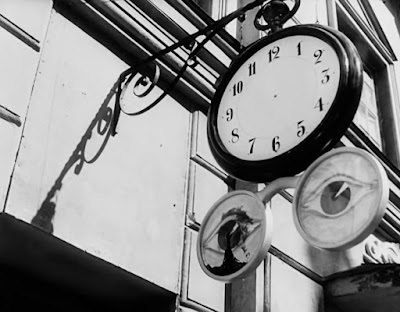 She stretches out her hand to him, but then rushes off too fast for the old man to follow her and disappears. “If only you had stayed with me,” he yells out to her. This missing segment would offer further evidence that losing Sara1 was the main regret in Isak’s life. When Evald awakens, he and Marianne are alone together in the parked car, and she confides to him about her troubles with her husband Evald. She had informed Evald a few months earlier that she was pregnant, but he was adamantly opposed to bringing a child into the world. He emphasized how different they were by pointing out that her overall desire was to live and create life, while his was to be “stone-cold dead.” She was told by Evald that she would have to make a choice between him and the baby. This level of coldness goes beyond Isak’s, but as she tells Isak, when she saw his cold-as-ice mother, she understood how both Isak and Evald had grown up to be so cold – it was in the family. She tells Isak that when she gets to Lund she will tell her husband that her choice is the baby. Then the effervescent Sara2 and her two buddies rush up to the car to present Isak with the wildflowers they have just picked. Evald comes to Isak’s bedside, and Isak asks him about his relationship with Marianne. Evald glumly says he will give in to her demands, because he cannot live without her. After Evald leaves, the film closes with Isak, now more contented, settling into sleep as he recalls a pleasant childhood memory of his parents relaxing outside the summer cottage. Wild Strawberries ends its rather subtle and complex story in a contemplative mood. 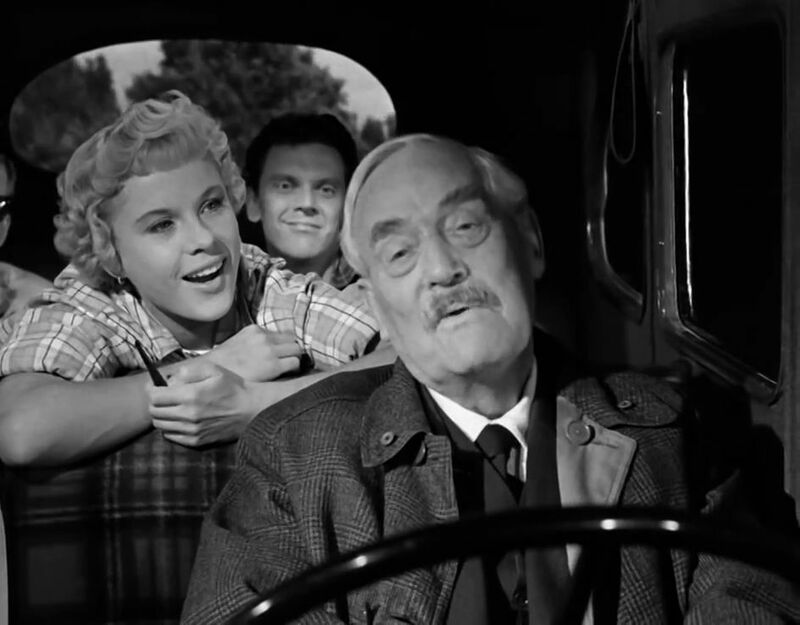 It all goes down smoothly for the viewer thanks to the film’s superb production values. The cinematography, editing, and acting are all so well done that we barely notice just how smoothly they were performed. They effectively enhance our fascination with what interests us, Isak’s journey and its meaning. 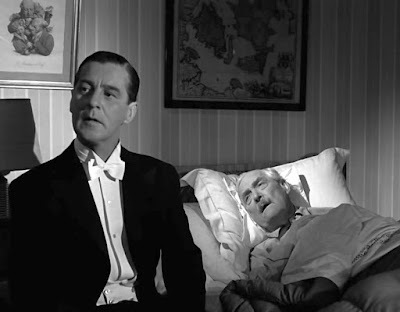 Over the course of Isak Borg’s long day, people from different generations have been presented – from the headstrong exuberance of youth, through the quarrelsome bickering of mature couples, to the cold rigidity of old age. According to the way Isak was accustomed to viewing things, everything and everyone is accountable; and guilt is to be assigned appropriately. But this kind of judgmental accounting, characteristic of Isak, Evald, and others, can only lead to accumulated resentment and a desire to withdraw from life. However, this is not where Isak ends up at the end of the film, from my perspective. At the end, there is a change in Isak. He is willing to suspend his judgmental side. He is comforted to hear that Evald and Marianne are on the way to working out their own problems. At the same time, he is not simply giving up and accepting things just as they are. No, I think he has come to a more enlightened state. Rather than perpetually mourn the departure of Sara1 from his life, Isak has turned to see that the mysterious magic of love and life is always present. Sara1 can be reincarnated into Sara2, who represents the eternal vitality of life. After all, she loves him “today, tomorrow, always.” In this sense I detect an echo of Bergman’s To Joy, and even more, of his Summer Interlude, wherein the female protagonist learned to celebrate and affirm the wonder of life’s mysteries, even when they are sometimes terminated in an early death. After all, death is inevitable for all of us, and we must remember to accentuate those opportunities that life perpetually affords us, as well as savor those memories of beautiful moments. Mark Le Fanu, “Wild Strawberries: ‘Where Is the Friend I Seek?’”, The Criterion Collection, (11 June 2013). 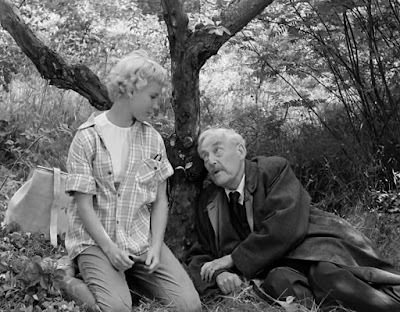 Peter Cowie, “Wild Strawberries”, The Criterion Collection, (11 February 2002). Bosley Crowther, “Screen: Elusive Message; Wild Strawberries' Is a Swedish Import”, The New York Times, (23 June 1959).